Printed on the bottom front is Yours truly, “Little Jake”. 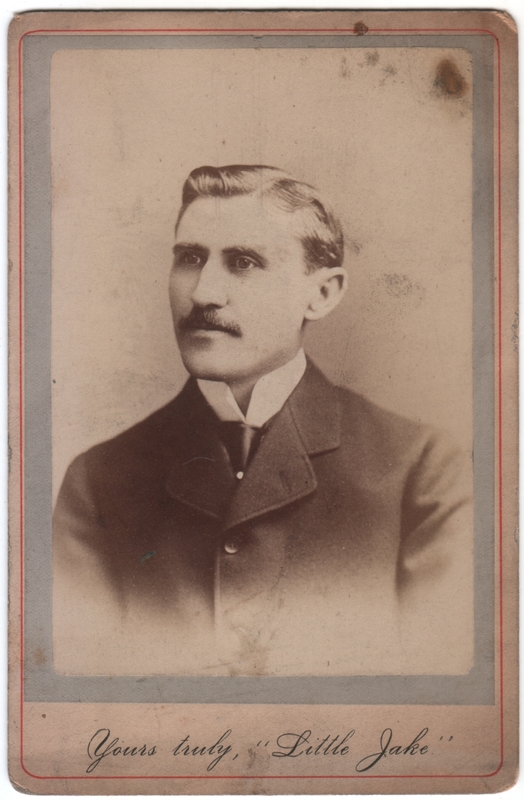 It’s unusual for the subject’s name or a greeting to be printed on a cabinet card or other photo of the time. It’s the sort of thing usually reserved for celebrities or other dignitaries, the card often being published and sold as a collectible or souvenir. Such was the case with a photo I posted here, which turned out to be one of a collectible set of the family members of a President. The implication, then, is that “Little Jake” was somebody well known, or who fancied himself well known. But who was he? Was “Little Jake” perhaps a stage persona? I didn’t find anything online, but I’ll admit I gave up quickly. Does anybody know? Meanwhile, it’s fun to speculate. The name of the photographer and location would help immensely in deciphering who he is in the big scheme of things. Any clues? No, sorry, I would have posted such information if it were available here. Okay, quick search and this is what I came up with. Profile shots are at different angles and ages so I am not certain but the dress style he chooses is very dignified and so the person I found fits this perfectly. My guess is “Little Jake” Seligman from Saginaw, MI. Will have to do more research to confirm. This is an image on an ad next to a martini glass. This is an image and short bio of his claim to fame. Hey, Karen, what an intriguing possibility! Thank you for looking! I want to see Big Jake before I comment. Yes indeed! I did wonder where the moniker “Little” came from.